Sixteen people have been reported killed by a severe snow storm moving through the north-eastern after disrupting Christmas in the Midwest. States in New England are seeing heavy snowfall, with over a foot (30 cm) already fallen in parts of Massachusetts, weather officials said. Lebanon, Maine reported 12 in of snow, with up to 18 inches expected in the state and nearby Vermont and New Hampshire by the end of Thursday. 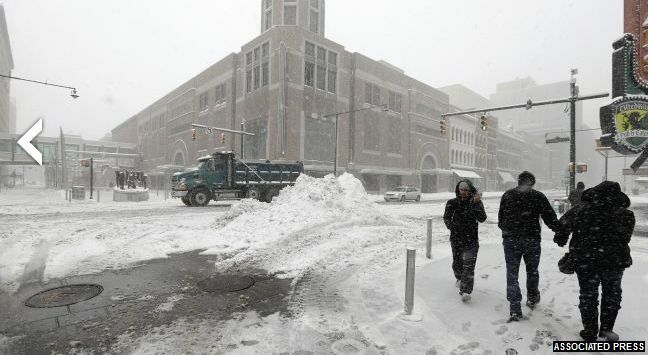 In Concord, New Hampshire, resident Dale Lamprey said he had been on the streets before 05:00 EST on Thursday morning, trying to clear the snow. “It’s been windy, it’s been snowing and I think it changed over to sleet and freezing rain at one point. It’s pretty bad,” he told AP. Inbound flights were delayed in Philadelphia and at the three New York area airports, as thousands of travelers were trying to return home after Christmas. Earlier in the week Little Rock, Arkansas, saw its first snow on Christmas Day in 83 years, while in neighboring Oklahoma seven inches of snow were blamed for a 21-vehicle pile-up on an interstate highway outside Oklahoma City.